Brandon and Kyle pickin’ and a-grinnin’ while dehydrating fresh catnip! Brandon planting a variety of sedum or a “Wild Stonecrop” plant donated by Laurice Hohlt! David’s getting in on the planting fun too! Crouching tiger, hidden Kyle! Haha. Kyle helpin’ out with the planting action. 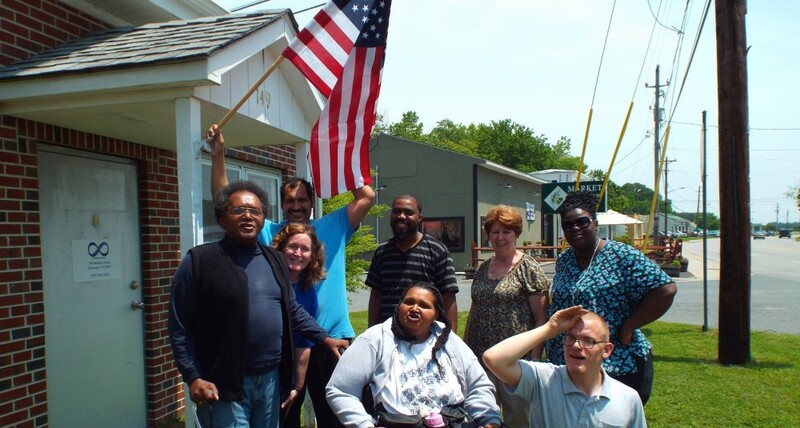 This week members of No Limits took a walk over to explore the old businesses of Tasley, VA, where our program is located. Here you see the old “Cope’s Ice Plant”. Although we could not go inside the buildings due to safety, it was interesting to learn about what a busy little town Tasley used to be! After doing research, we learned that Tasley used to be a “bustling railroad town” that “boasted three restaurants, four general stores, a hotel, post office, rail station, two tractor dealerships, two sawmills, volunteer fire company, ice plant, coal sales, car dealerships, several produce grading sheds and power plant.” Click here to learn more about our little town of Tasley! All hands on deck to pull weeds. The cucumbers say “thanks”! It is always nice to relax a little with good friends after a day of hard work! A close up of our new Moonglow Pear Tree. No Limits now proudly has two pear trees growing in the yard! Planting the Aristocrat Pear tree. We can’t wait to watch these trees flourish and produce yummy fruit! It has actually been a perfect week for us to have wet weather here at No Limits. We had two fundraisers to help out with this week that will benefit our furry friends in need throughout the community. In this picture you see our planning notes for what needed to be baked. The first fundraiser is a plant/bake sale for the Chincoteague Island Community Cats group who are working towards implementing a sustainable Trap-Neuter-Return (TNR) program for feral cats on Chincoteague Island. More information on this fundraiser can be found on the CI Community Cats Facebook page (link). The second fundraiser we baked for is the Pawsome Bingo Fundraiser hosted by Dogs Deserve Better Eastern Shore (link). This fundraiser will benefit the purchasing of an air conditioning unit for the animals at the Eastern Shore Regional Animal Control Facility. More information on this fundraiser may be found on the Dogs Deserve Better Eastern Shore’s Facebook events page (link). Brownie making time – bake on David! Our sugar cookie set up! No sleeping CL it’s time to bake! Hehe! Aside from baking, we also donated a few house plants and catnip samples (both cultivated by members of No Limits) to the CI Community Cats Plant/Bake Sale! Brownies and cookies all packed up and ready to go! Go team! Corina and Amy being expert cake and cupcake decorators. Everything turned out so well! We hope our hard work will really pay off! We enjoy helping out and giving back to our community whenever possible. We also think that it is just perfect that a photo of our dear friend Kate is along side these baked goods as we think that she would be proud of the great work we are doing! Good job making those biscuits, but don’t eat them…they’re for the dogs! Bake on Amy, bake on! Zel hard at work caring for the No Limits Hens. Great job Zel! Glazing pots for an upcoming fundraiser! Terra cotta pots must be glazed before they are painted. A great shot of our beautiful sign pictured with our beautiful irises. Zel working on a brain teaser puzzle before program begins. These puzzles are difficult but so much fun! Melissa Glennon of Riverside Medical Group came in to give a wonderful presentation on a few programs available in our community that she helps to operate. We learned about Riverside Shore Home Health Services, Senior Perspectives, and Riverside Hospice Services. It was a very informative presentation, and it was interesting to learn about various services throughout our community. Thank you Melissa! Zel and Amy staying cool in the shade while the No Limits Hot Dog Cart gets set up for the first time this season!! Amy just chillin’ and enjoyin’ the weather before program begins. David and Maryann hard at work plantin’ fresh basil in the herb garden. Brandon the Plant Doctor reviving a few plants with transplant shock. We will take pictures when they are “better” but Brandon is currently still “treating” them. Haha! Sherry and Amy doing a great job organizing our plant containers. Our Azalea from our dear friend Margaret Ann is back in bloom! Yay! Thank you to Maryann and Northampton County Fire and Rescue for donating these hats to No Limits. We had a mini contest to win the hats and Zel and Jason won! Lookin’ good men! Shovel on Brandon, shovel on! Mulching the banana plant! Good job Brandon. We like to put mulch around our plants to help with weed control and to help our plants stay moist in the heat!